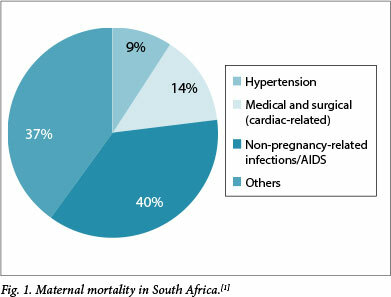 Medical disorders in pregnancy are one of the top five causes of maternal mortality in South Africa (SA), cardiac disease (CD) being the main contributor to this group. In developed countries, surgically corrected congenital heart disease (CHD) comprises the greater proportion of maternal deaths from CD. In SA and other developing countries, acquired heart disease such as rheumatic heart disease and cardiomyopathies are the major causes, although CHD remains significantly represented. Both congenital and acquired cardiac lesions may present for the first time during pregnancy. CD may also occur for the first time during or after pregnancy, e.g. peripartum cardiomyopathy. The risk to both the mother and the fetus increases exponentially with the complexity of the underlying disease. Generally, the ability to tolerate a pregnancy is related to: (i) the haemodynamic significance of any lesion; (ii) the functional class - New York Heart Association classes III and IV have poorer outcomes; (iii) the presence of cyanosis; and (iv) the presence of pulmonary hypertension. While the ideal time to assess these factors is before conception, women frequently present when already pregnant. 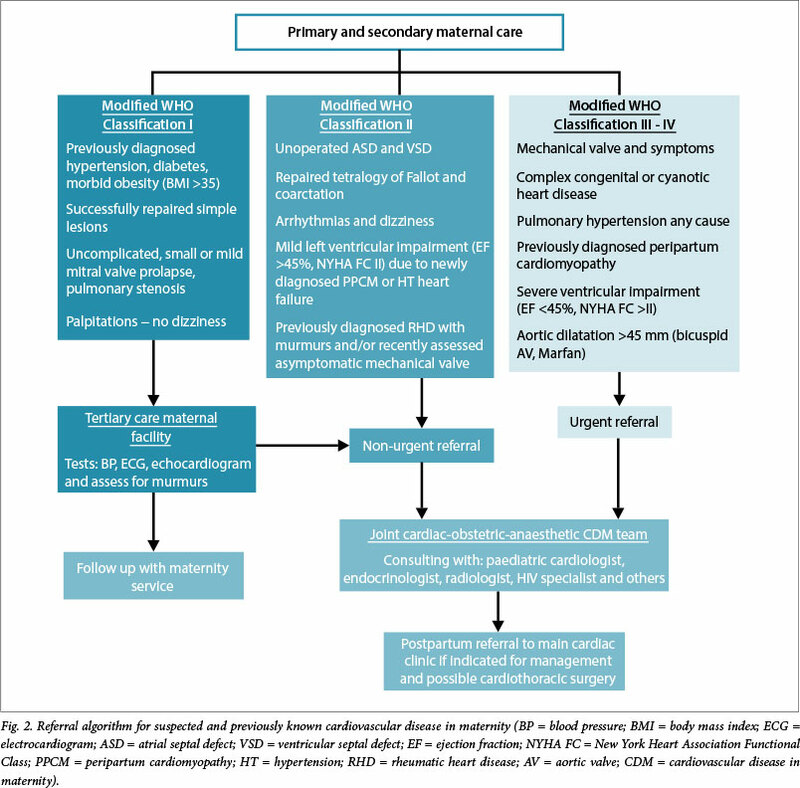 This review discusses risk assessment and management of CD in pregnant women and the role of a combined cardiology and obstetric clinic. The care of pregnant patients with CD requires special attention to diagnostics, treatment and continuous follow-up. Conducting a systematic, accurate and realistic risk assessment for potential maternal and fetal complications and anticipated adverse outcomes, both during pregnancy and postpartum, is vital to the success and safety of the pregnancy. When evaluating the impact of CD in pregnancy, it is important to mention the physiological adaptions occurring in a normal pregnancy. With regard to the circulatory system, the primary event is peripheral vasodilatation, which results in a decrease in peripheral vascular resistance. Due to this effect the cardiac output (CO) increases by approximately 40%, which is mainly achieved by an increase in stroke volume (SV) and is secondarily due to an increase in pulse rate (PR). These variables are expressed by the equation CO = SV x PR. It is not uncommon for the PR to increase by up to 20 beats/min. The systemic blood volume increases by approximately 50% antenatally and by a further 50% at delivery, when a massive autotransfusion of blood from the involuting uterus into the general circulation occurs. In general, pregnancy is a well-adapted, physiologically altered state, provided that every system (including the cardiovascular system) remains healthy. However, in the presence of CD, the circulatory changes may adversely affect maternal survival, morbidity and perinatal outcome. The close interaction of the cardiovascular system and the placenta has provided evidence for a cardioplacental syndrome that has been described previously. Many disorders can be identified by a clinical examination and a patient's history, but in the majority, if not all cases, an echocardiogram is required to confirm clinical suspicions. Both congenital and acquired cardiac lesions may present for the first time during pregnancy. In many cases the history is unclear and documentation of previous surgical procedures unavailable. CD may also occur for the first time during pregnancy or the postpartum period, e.g. in peripartum cardiomyopathy. In all cases, a detailed family history is especially important and may highlight the risk of a congenital lesion, as well as potentially fatal conditions such as arrhythmias and sudden death syndromes. Symptoms such as increased shortness of breath, decreased effort tolerance, orthopnoea, paroxysmal nocturnal dyspnoea, syncope, palpitations and chest pain are all potential indicators of CD. However, in pregnant women it may be impossible to distinguish such symptoms from those which commonly occur during a normal pregnancy, i.e. shortness of breath, fatigue and decreased effort tolerance. In addition, the cardiovascular examination of a healthy pregnant woman may well reveal peripheral oedema, a raised PR and a physiological murmur. Critical evaluation of the symptoms described in the history will enable the clinician to distinguish pathology from normal physiological changes. For example, a woman who cannot complete daily tasks owing to worsening shortness of breath, can be categorised as a New York Heart Association (NYHA) class III or IV patient, and if she has trouble sleeping it would be cause for concern. On the other hand, a woman who maintains her usual functional level with the typical physiological breathlessness of pregnancy most noticeable at rest and decreasing with exertion, would be unlikely to have cardiovascular pathology. A resting tachycardia, a pathological murmur and/or signs of cardiac failure are findings that would require urgent investigation. 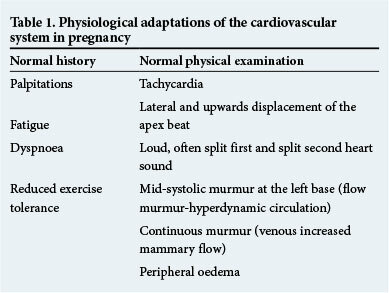 Table 1 summarises the physiological adaptations of the cardiovascular system during pregnancy. Investigations such as an electrocardiogram (ECG), a 24-hour heart rate and rhythm (Holter ECG) recording or an echocardiogram are technically more difficult, particularly in advanced pregnancy, but should be performed if indicated. Table 2 summarises the normal adaptations found on a 12-lead ECG of a pregnant patient. The transthoracic echocardiogram is the most important screening and diagnostic tool in identifying structural lesions and assessing cardiac function. An additional benefit in pregnancy is that it does not expose the patient to radiation and can be repeated as often as required. However, an echocardiogram is technically more difficult to perform in a pregnant woman owing to the gravid abdomen, breast engorgement and rotation of the heart. A 24-hour Holter ECG should be used if there is clinical suspicion of significant arrhythmias or if the patient complains of symptoms such as prolonged palpitations or syncope. More sophisticated devices, such as loop recorders, have been inserted into a select group of patients who are at high risk of potentially fatal arrhythmias. Once a diagnosis has been made and cardiac function evaluated, assessment of the potential effect of the pregnancy on the CD, as well as the effect of this condition on the pregnancy, should be documented. Arrangements should be made for the delivery and follow-up during the antenatal and postpartum periods. An optimal time for these plans to be implemented would be before conception, as this would allow for a baseline assessment of cardiac function and provide an opportunity for the relevant counselling. Indicated interventions can be performed prior to conception, thus avoiding fetal exposure to ionising radiation and procedural risks. In the case of a familial condition, or if there is a risk of inheritance (e.g. congenital cardiac lesion), it may also be relevant to refer the patient to and include a medical geneticist during the pre-pregnancy counselling sessions. Once the patient has expressed a wish to conceive, cardiac function should specifically be evaluated and adjustments made to medications if necessary. There are various risk scoring systems available to assist in the counselling of patients with CD in their reproductive years. Risk scores are population-dependent and any given study examining risk should therefore have an adequate prevalence within the sample population of a specific lesion or clinical scenario to be able to evaluate the risk meaningfully. WHO I: No increased risk of mortality, mild increased risk of morbidity - low risk. WHO II: Small increased risk of mortality, moderate increased risk of morbidity - medium risk. WHO III: Significantly increased risk of mortality and morbidity - high risk. WHO IV: Extremely high risk of mortality or severe morbidity -pregnancy contraindicated. The risk to the mother and fetus increases exponentially with the complexity of the underlying disease. Based on the risk categories described above, a referral algorithm (Fig. 2) has been developed by our unit, which provides a guideline to assist in the correct referral of pregnant patients with suspected or known CD to a multidisciplinary combined cardiology and obstetric clinic. What is the present cardiac function? The cardiac function of a pregnant woman needs to be assessed by applying the NYHA functional class, and any current prescribed medication required to maintain this functional class needs to be documented. The physical examination must include blood pressure, heart rate and an overall clinical examination, including an ECG. If the patient has an abnormal clinical examination or ECG, an echocardiogram is indicated. What is the severity of the lesion (according to the WHO scale) and its impact on cardiac function? A patient with a large ventricular septum defect may, for example, have a severe left-to-right shunt that puts the right heart under increased strain when the volume expansion of pregnancy commences. If the pressure in the right heart and pulmonary vessels increases to that of the left heart, the result is a left-to-right shunt, leading to cyanosis. Another example is the consequence of severe mitral regurgitation, which may lead to an enlarged left atrium, clot formation and atrial fibrillation. What is the risk to the fetus? There are certain risks to the fetus in terms of inheritance, growth restriction, use of medication, and preterm delivery. What is expected to occur during pregnancy, and how will this be managed? During pregnancy there is often a decrease in effort tolerance and an increase in shortness of breath, requiring the administration of a diuretic, e.g. hydrochlorothiazide or furosemide. Patients may also experience palpitations, which can be controlled by a beta-blocker. WHO I: Limit visits to once during the pregnancy. WHO II: Follow-up every trimester. WHO III: Monthly or bi-monthly review by a multidisciplinary team of cardiologists and obstetricians. WHO IV: Advise against pregnancy or, in some cases, recommend early termination. If the patient continues the pregnancy, bi-monthly review is advised. More medication is required to maintain current functional status. New symptoms, e.g. chest pain, have developed. Increased PR (either a resting tachycardia or a raise after mild exertion, such as walking from waiting area into the examination room). Change in the cardiac murmur or signs of cardiac failure, such as crepitations at the lung bases or raised jugular venous pressure. Signs of infection (in the case of a replaced valve or valvular CD). Spontaneous vaginal delivery is recommended in pregnant women with CD. In most cases, the decision for a surgical delivery is based on obstetric indications. A surgical (or assisted) vaginal delivery may be indicated to reduce maternal Valsalva exertion in the second stage of labour. In all cases, the mode of delivery should be planned before the onset of labour and additional anaesthetic advice obtained in cases where an epidural procedure is indicated (e.g. mitral regurgitation) or an emergency caesarean section is anticipated. Pregnancy is a state of physiological thrombophylia. The risk of valve thrombosis is increased in pregnancy and anticoagulation therapy must be continued. Warfarin is well documented to be the most effective anticoagulant and is best for the mother, giving the lowest risk of thrombosis; however, it crosses the placenta and is associated with adverse fetal outcomes, including teratogenesis (nasal hypoplasia and epiphyseal stippling), miscarriage, stillbirth and intracranial bleeding. Low molecular weight heparin (LMWH) has no risk to the fetus, but a higher risk of maternal thrombosis. The risk of teratogenesis of warfarin is from 6 to 12 weeks' gestation and has been documented as between 3.4% and 6%[13,14] and as high as 11% (C Elliott - unpublished MMed data), and the risk increases with increased dosages of warfarin >5 mg/day. At 6 weeks the patient needs to be hospitalised and warfarin replaced with heparin. Continuous intravenous infusion of unfractionated heparin is recommended, keeping the partial thromboplastin time (PTT) >2.5 x control value. The use of therapeutic LMWH is still controversial owing to the high rate of valve thrombosis and the difficulty of monitoring therapeutic dosage and efficacy. If used, it is essential to monitor antifactor Xa levels at least weekly to ensure a 4-hour peak level of 0.8 - 1.2 U/mL. Low-dose aspirin should be used along with LMWH at a dose of 75 mg/day. Warfarin can be restarted after 12 weeks' gestation, ensuring the international normalised ratio (INR) is 2.5 - 3.5. Warfarin needs to be discontinued again at 36 weeks, the patient re-hospitalised, and intravenous heparin restarted. It should be discontinued 4 - 6 hours before a planned delivery, or if the patient is in established labour. Heparin infusion should be restarted 4 - 6 hours after delivery if there are no bleeding complications and if no regional anaesthetic has been given, and warfarin re-initiated between day 3 and 7 postpartum. Adverse neonatal and perinatal outcomes are more common in pregnant women with CD. There is a relationship between the complexity and severity of the CD and fetal and neonatal complications. [16,17] In general, the greater the risk posed by the mother's CD, the greater the risk to the fetus. The potential adverse effect of maternal CD on neonatal outcome is increased if there are concurrent obstetric risk factors, including maternal age >35 years, although the mechanisms behind this are not fully understood. There are various explanations for the increased rate of neonatal complications, e.g. cyanosis is associated with fetal growth retardation. A decrease in maternal oxygen saturation is directly related to birth weight and perinatal mortality. Adverse perinatal outcome may be explained by the decrease in uteroplacental blood flow resulting from haemodynamic compromise in patients with CD. [9,16] Placental insufficiency plays a role in preterm delivery, fetal growth restriction and perinatal loss in patients with a compromised functional class. Fetal cardiac contractility and output are adversely affected by hypoxaemia resulting from uteroplacental insufficiency. The association between the abovementioned neonatal complications and cognitive and neurodevelopmental delay has been demonstrated. This should be included in the discussion with the patient during the pregnancy, or at the pre-conception visit. Given the importance of CD in pregnancy and the impact on maternal and fetal mortality and morbidity, there is a clear need for structured assessment, appropriate referral and surveillance by a multidisciplinary team. The correct and early identification of pregnancy-specific conditions such as peripartum cardiomyopathy cannot be overemphasised. Pre-conception diagnosis, counselling and risk assessment are ideal but, if this is not possible, correct diagnosis as early as possible in pregnancy is absolutely vital to improve maternal and fetal outcome. The authors would like to acknowledge the support of Mrs Sylvia Dennis, Hatter Institute for Cardiovascular Research in Africa, in preparing the manuscript. This research could not have been conducted without the funding support of the University of Cape Town, the Medical Research Council of South Africa, the National Research Foundation, the Maurice Hatter Foundation and Servier. We also wish to thank the physicians and nurses at the divisions of Cardiology and Obstetrics and Gynaecology for their support.